It’s hard for me to believe that there would ever come a point in time that I would not only be a runner, but be a runner so much that I actually got tired of it. Wow! It’s amazing how much your life can change when you change your priorities. But that time has come for me again. I say again because this isn’t the first time I took a break from running. In 2009, I actually walked the Kentucky Derby Festival mini-Marathon and you know what? That’s hard too! It was an entirely different experience and I’m so glad I did it. This time, it was more or less, I just haven’t felt like running lately. Back in June, we hit the 90 degree mark and have had too many super hot and humid days to even think about running outside (for me). The treadmill was not calling my name either. So I decided, so what? I will take a break. Do some other workouts I enjoy, no big deal. I noticed that I didn’t really miss running. I also didn’t miss the major appetite it gave me that sometimes caused me to eat too much. I didn’t miss the achy hips or tiredness I sometimes get. I especially did not miss getting up early on Saturday mornings for races (hehe). In July, we closed on our new home and started going through the seemingly never-ending process of packing, painting, moving, unpacking and so on. No time for running really and it was still too hot! I really gave myself over to walking, yoga and some weight training. I even signed up for MyFitnessPal to make sure I’m still getting essential nutrients and to support some friends. And I have been feeling great! I don’t use a scale anymore but judging by my clothes, I’m a bit lighter. My moods are better and I have more energy to do things around the house and keep up with other responsibilities without being exhausted in the process. Now, maybe running is not entirely to blame for this. I think I just needed a rest. Needed to slow things down a bit and get some perspective. It’s been a couple of months now, the weather is cooling off and things are getting settled in my life again. I have decided I am ready to ease back into running. But nothing too crazy. I haven’t signed up for any races and while I do have hopes of someday running a marathon (such as my dream of doing the 2012 NYC Marathon with my good friend Mari), I’m not in a big hurry. I actually have dreams of standing on the side lines for someone else soon! Anybody need a cheerleader? Or maybe I will volunteer to work at a race. For now, I have decided to start from scratch, the way I originally “taught” myself how to run. With intervals! I am running a 5k tomorrow morning, so I knew that today would either be rest or cross-training. I’ve been feeling pretty good today so I decided I wanted a good sweat session! I started off with 30 minutes on the elliptical. I kept the ramp at 10 but I gradually increased the resistance from 5-8 when I got too used to it. I read some of the latest issue of Vegetarian Times while I worked up a sweat. Afterwards, I carefully did some upper body weights. Since I injured my arm a few days ago (it’s better now), I was sure to use proper form and weights just a tiny bit lighter than I usually would. So far, so good! For each exercise, I did 2 sets of 20. Since I was in the weight room and not on an exercise mat using a body bar, I think what made the difference was being able to see myself in the mirror. When it’s right there in front of you, it is easier to see what you are doing and to check and make sure you are doing it correctly. This is how I usually work out but for some reason the other day, I was in a room without mirrors and just judging by how things felt. That is probably how I hurt myself. Noted! This was a great workout and really made me realize how much I love the challenge of weight training. I’m definitely planning to get it back into regular rotation here soon. I have absolutely no idea what you did to INJURE YOUR ARM but I wish I knew, so I could tell you not to do it again. Oh well, be careful. That’s right. Somehow I managed to jack up my left arm. Yesterday, I did a brutal 10 minutes on the stairmaster and then headed into the weight room to repeat last Friday’s killer arms session. Honestly, I felt great afterwards and even now, with the exception of my left arm, I’m not very sore like I was Friday-Monday the last time! Basically, this part of my arm hurts. I don’t know how I did it because it didn’t start bothering me until 9:00 last night while I was sitting on the couch watching TV reading blogs on the laptop. It came on pretty suddenly too, not like that delayed onset soreness you get sometimes. I think it’s the wrist because it hurts to bend it forward or backward or put weight on it, pick something up with it, etc. But the pain shoots down sometimes all the way to the elbow. It’s uncomfortable no matter where I rest my arm. Not excruciating, just uncomfortable. So, obviously no weight lifting for me for a while. I’m hoping it’s just minor and I can take a couple days off, ice it, and be good by next week. Looks like it’s cardio time! I was feeling a bit sickly today, thanks to allergies and the medication I took, which I won’t do again. I swear, it makes me feel worse than I did before, which is why I usually never take anything but my congestion and cough were pretty bad so I gave in. Ugh! I had really bad allergies as a child, received really good treatment and haven’t had any problems since. But for some reason this year has been horrible. My mom suggested going and getting re-tested so that is a possibility. We started out with a quick 1.87 mile run (in 16:06! 8:37/mile pace!) and then came back for some weights. The chest presses were pretty easy but for most of the other moves, I had to do sets of 10-20 with a little break in between. My arms were shaking! Then we did 50 regular crunches, some leg lifts, and side-to-side crunches with a medicine ball (50 or 25 each side). Lastly, we finished with side extensions — 50 (25 each side) holding 5 lb weights. 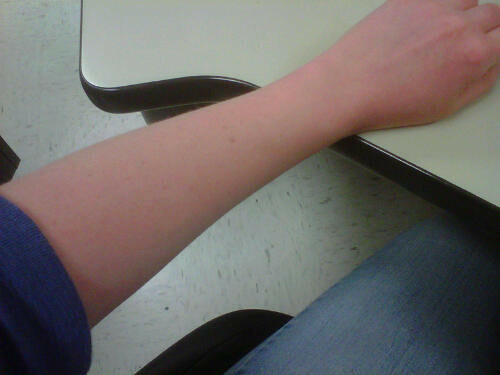 Do I even have to tell you how jello-like my arms are right now? They will definitely be sore tomorrow! Stairmaster + Weights = Yowzah! Yesterday, I decided to do a little crosstraining at the gym instead of running since I’m not really training for any races other than 5K’s right now. I started off my workout with an easy 10 minutes on the stairmaster to warm up, which I had not done in a long time! It was NOT easy. They also switched machines since last time I was there and this thing was rather intimidating. But, I hopped up on there and even though I pretty much had to look at my feet the whole time to keep from tripping, it was the most intense 10 minute workout of my life. My heart was beating hard and I was already sweating by the time I got done (I gradually increased the levels from 1-5 over the 10 minutes). Afterwards, I hit the bench for some weights. It’s nice now that the semester has ended, the gym is much less crowded. So I had plenty of space to do everything I wanted to. It was an awesome workout! I am a little sore today which tells me that it’s been way too long since I’ve done this much weight training. Can’t wait to keep it up this summer! Do you weight train? What do you like or dislike about it? We had quite the rainy, cool day on Friday so I was forced inside to visit an old enemy friend, Ms. Treadmill! I warmed up for 5 minutes and then ran 3.25 miles in 35 minutes before cooling down for another 5. I’m not worried about pace since this was on the treadmill. I gradually increased my speed from 5.0-6.0 over the course of 33 minutes and then the last few I sprinted between 6.0-7.0 which felt really good. I was a sweaty mess when it was over! I also decided to do some weights yesterday because I had time. I didn’t feel like doing multiple sets of anything, so I just did a bunch of exercises and tried to hit all the muscle groups I could. I’m hoping to take my dog for a nice long walk later today since I’m off work. The sun is out but I’m still waiting for it to warm up a bit more out there! Yesterday, I was not feeling 100%. I have a sore, irritated throat and I didn’t have as much energy as usual. I’m thinking since we went from 40 degrees on Monday to 65 on Tuesday, it’s my Springtime allergies flaring up. But I decided a workout would (hopefully) make me feel better! First, I ran 1 mile outside on the track in 9:43! I was going to do two miles but after the second lap, I could tell I was done. But I managed to go inside and do some low intensity weight training. I felt pretty good after this workout and for a while afterwards. But toward the end of the night, my throat got worse and today it’s showing in my voice. But I’m just going to treat the symptoms and monitor how I feel before I decide whether or not to run today. Do you exercise when you are feeling under the weather? I love Body Pump classes. You might recall the ones from my recent gym visit and I also took them at the YMCA last year. Body Pump is literally a full body workout! In other words, you are isolating one muscle group at a time for an entire song. iPod with Lady Gaga, No Doubt, Pink, etc. Basically with each song, I started out slow, doing the exercise up for 2, down for 2. During the “bridge” of the song, I changed from 3:1, and then during the chorus, I did single counts. This is similar to what you would see in a Body Pump class. I tried to recall the sequence of exercises as best I could and included the songs that I specifically remember (next time I’m write it down). 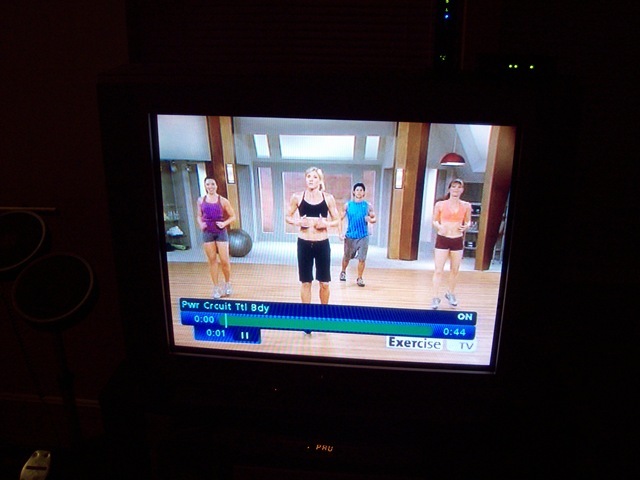 It was so much fun to try and recreate Body Pump on my own. Of course, the class dynamic is more fun and having an instructor always helps. But it’s good to know I can sort of do it on my own if I get the urge! After reading what a good workout Mari had with Jackie Warner last week, I decided to give the Exercise TV program a shot tonight. I love Jackie Warner. I watched the show “Workout” when it was on a couple years back and I think she is just totally cute. But I know she is brutal too, so I knew what I was getting myself into. The workout program is 44 minutes long, including a warm up and cool down. She isolates several different parts of the body: quads, hamstrings, glutes, chest, back, bis/tris/shoulders, upper abs, lower abs, and obliques. Each section has three different exercises followed by a “power burn” where you repeat all three exercises quickly. They were all challenging, by I was especially pushed by the upper abs and quads exercises. Perhaps I am just in good shape, but this workout wasn’t as scary or intense as I thought it would be. That being said, I am sitting here and my muscles are totally fatigued. Especially my legs and abs. I do wish their had been more upper body stuff but this program gave me an opportunity to hit a lot of muscles I tend to ignore. I definitely recommend it! 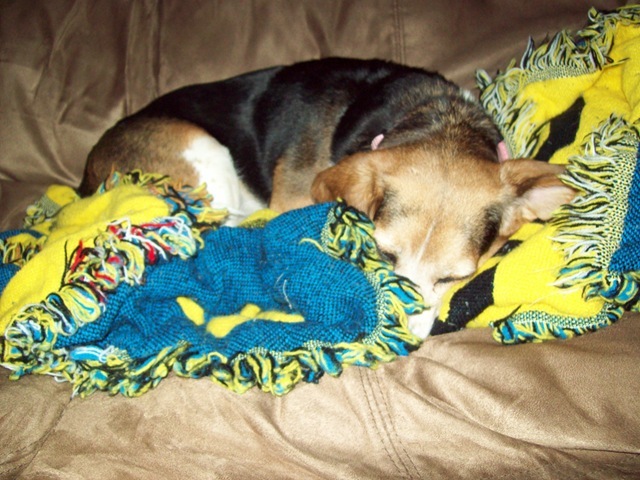 Here’s what my lazy dog Suzie did while I worked out! She is so lame. Hit me: what are your favorite TV or DVD workout programs?